Disposable plates are one of life’s great paradoxes to me. Yes, they are inexpensive, but never, ever reusable. It doesn’t matter how pretty they are, what holiday they are dressed up for, how organized they can be with their little sections, or if they are made of paper, plastic, or Styrofoam. They are dirtied and thrown away. Sometimes they are loaded up with so much junk that they have to be used two at a time. That seems really inefficient, but they are so cheap that it doesn’t really matter. Paper plates are terribly useful, but not very valuable. On the other end of the spectrum is the fine china. My mother bought me a set of beautiful Spode plates for Christmas this year. They match my blue and white everyday plates, and I loved the pattern on them. Four of them are in a display case, and the rest are wrapped up in paper in a box in the bottom of the cabinet. I never eat off fine china. My mother has 2 sets of china at her house, and we use them at Christmas and Thanksgiving. They have to be hand washed. We’re afraid of breaking them because her wedding china was discontinued years ago. The plates that are in my dish drainer right now (indicating that they have been used recently) are from a set that I bought with my friend Teri when I was in college. We went to an estate sale in Franklin, and found all these plates. I think there were 12 dinner plates, 15 salad plates, 15 dessert plates, and 15 plates that were a different size than the other 3 plates I mentioned. Teri bought all of them for me for $15.00. All of them match and are made by the same company, but the smaller plates all have “American Airlines” stamped on the bottom. (Go figure.) I don’t have a dishwasher, but they’re dishwasher safe. They’re microwave safe. They’re safe for a place to rest my hot glue gun or to use as a coaster in a pinch. I loved them so much that I bought blue glasses to match them, and blue and white bowls, and even blue coffee mugs, even though I don’t drink coffee. 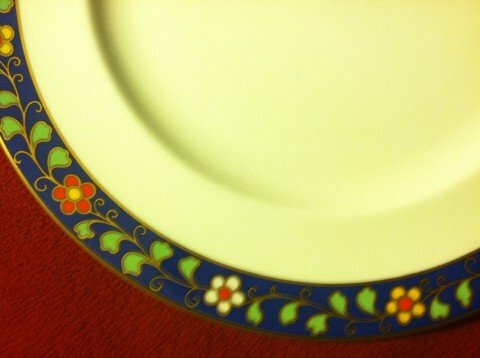 If you remember, I even liked the Spode plates because they coordinate with my American Airlines everyday plates. They’re loved, and even though they were inexpensive they are valuable to me because they useful. You’re not a paper plate. You’re not made to be used and discarded. If you treat yourself like you’re dirty and disposable, then you will be treated that way. It’s really that simple. If you don’t recognize your own strength and value, no one else will, either. You’re useful, pretty, and strong. You’re beautiful enough to pull out at Thanksgiving for the distant relatives you want to impress, beautiful enough that even if one of those weird little dessert plates is broken it is a real loss. But above all else, you are your best when you are serving others. Take the heat of the microwave and the days in the fridge with the leftovers and go enthusiastically back to the dishwasher. Be there every day, for fancy parties, frozen pizza, or dinner with friends. What a fun memory you just conjured up that was buried in the dusty parts of my mind. The used handmade needle point pillow cases I bought for myself are still with me after all of my moves across this nation. God made your mind keen and strong enough so both of us can smile today with these fond memories. Memories come when we need them. I am actually quite forgetful these days, but I think of you often when I use my dishes. (Remember, I eat at my parents’ house a lot.) Other memories pop in to surprise me sometimes…I’m just glad there are so many good memories to draw from.